As a bride, we know that there is a lot of pressure that goes along with wedding planning. Above all, we want our guests to enjoy the event just as much as we do. Of course you liked the dj or band you booked, but will your guests? There is nothing worse than looking over to see an empty dance floor. Here is a way to make sure that everyone will hear something they like and keep those hips shaking! 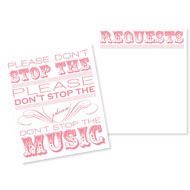 These music request cards can be found on The Knot, or talk to your stationer about creating some in your wedding colors. It may not call everyone to the dance floor as fast as the Cupid Shuffle, but everyone is bound to remember the groomsman who broke it down to his favorite Lady Gaga tune. How did you keep the party going at your reception? We would love to hear about it!